To game Ultima on the table top I will be using is Song of Blades and Heroes. These flexible rules are designed to allow the players to pick any Medieval fantasy setting, using any models. 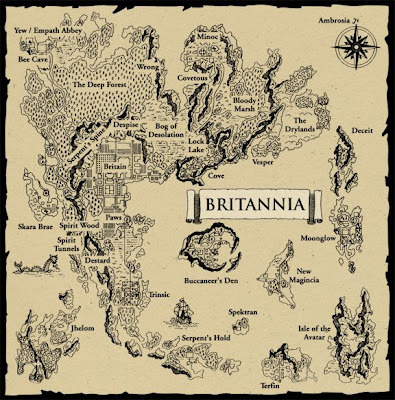 My chosen subject is Britannia, the world featured in the Ultima rpg series designed by Richard Garriott. If you are unfamiliar with the game here is a short description. Britannia is the name given to all the lands of the world. Britain is the capital city where Lord Biritish is king. It is populated by humans, but there are of course numerous monsters throughout the land. Naturally, caves and dungeons are plagued by horrid beasts. Britannia is home to another civilized people—the gargoyles. They are a monstrous looking lot, but no more or less violent than humans. Most live on the island of Terfin, but others are scattered in various towns across the land. I came into the series of PC games at Ultima VII. My miniature wargames will take place after the events of Ultima VI, and just before the beginning of VII. On the whole, Britannia is at peace. Although there has been no full scale war since the fight with the gargoyles 200 years ago, there is danger in the form of highwaymen, pirates, hoardes of monsters, rogue mages, etc. A suitable adventure is always easily found by a willing band of adventurers. For more backstory check out Ultima Wikia.